Targets fat and connective tissues under the skin. Initial consultation includes physical exam, and measurements are taken so that progress is well documented. Medication is administered just beneath the skin directly into the fatty layer, where it will slowly produce fat breakdown. Diet and exercise done in combination with Mesolipo will maximize results. Unlike the surgical liposuction, only the fat (not the fat cells) is removed. After 10 sessions, patients can loose 2 to 6 inches in their saddle bags, hips, thighs, waist, love handles, back fat, and chin. How fast will patients see results? Mesolipo results vary, according to body type, treatment goals, and severity of the problem. Most patients report improvement within 3 or 4 sessions. Mesolipo clients with low carbohydrate diets and regular exercise programs achieve optimal results sooner. Results typically last as long as diet and exercise regimen is consistent. Shape and weight is an ongoing and dynamic process. 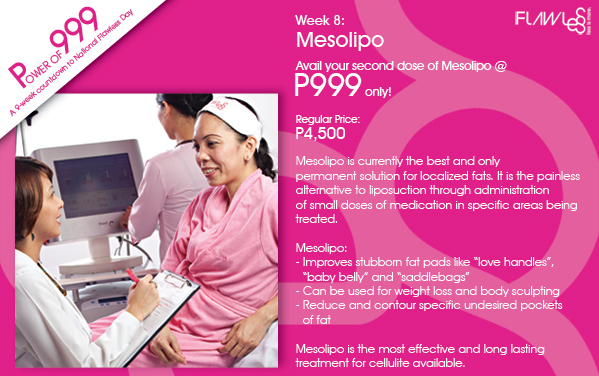 Mesolipo can help attain ideal body weight and contour. Poor food and exercise choices will affect results negatively. Flawless Mesolipo therapy is done through doses. Regular price per dose is P4,500. Number of dose depends on the condition of the area being treated. Join the Flawless Face and Body Clinic community page over at Facebook, click on the “Like” button and be updated on their latest product and services offerings.